With the holidays and stuff I wanted my next project to be something quick and fun. I think this hat will fulfill those criteria. It's from the latest issue of Rebecca. 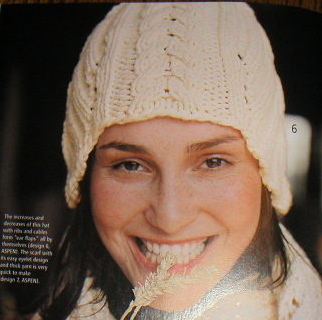 The pattern is called Hat with Braids, btu I don't see any braids anywhere. It's got some very subtle earflaps though. I have some yarn in my stash that I plan to use. It's actually leftover from another Rebecca project, the sweater with the boatneck and cables. I was also browsing through Rowan 36 and saw some sweater possibilities that I may be interested in.